Leading Manufacturer of gas liquefaction units from Thane. Snow cool systems India ltd. Mumbai designs and manufactures refrigerated Gas Liquefaction Units and refrigerated vapor recovery units. We manufacture chlorine liquifies, acetone liquifies, oxide liquifies, co2 liquifies, ammonia liquifies, sulphur dia oxide liquifies. We also manufacture refrigeration plants for chlorine vapor recovery, acetone vapor recovery, oxide vapour recovery, co2 recovery, ammonia vapor recovery, sulphur dia oxide vapor recovery, hydrogen recovery, propane recovery, methane recovery, lng recovery, LPG recovery and many more. 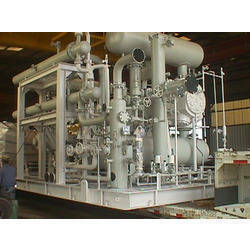 Looking for Gas Liquefaction Units ?